Luckily it wasn’t. 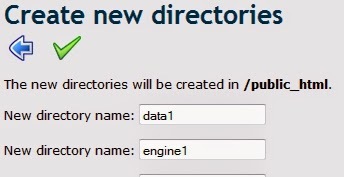 The actual address of the website you are using to store your wowslider slideshow doesn’t matter, as it will never be seen by the user of your blogger blog. A subdomain of another site is quite adequate. Call it anything at all: even a string of completely random nonsense will do!!!! Then you need to enter a password. Maybe it is worth mentioning that they emailed the password back to me in the confirmation email, so my advice would be to use a unique password and change it to something else the moment you get access to your account. Then there was a facebook ‘like’ button, which was a bit of a surprise: It seems a bit like putting the cart before the horse, asking me to ‘like’ something I haven’t tried out yet! Finally there is a ‘capcha’. I hate these, but luckily for me this one was fairly easy to make out, once I had my reading glasses on! Now at this point I broke off and made a wowslider slideshow. I should I think point out that to do this sucessfully you will need images which are all exactly the same size. My chosen format was using the ‘Block’ template and ‘Basic linear’ slide transition. I turned off the navigation buttons but left ‘pause on mouseover’ turned on. I would recommend deciding the size you want your slideshow and then making the images the correct size. Probably best NOT to try resizing the slideshow once it has been made. Now you will be aware that Wowslider creates a file called ‘index.html’ in the ‘WOW Slider’ folder. 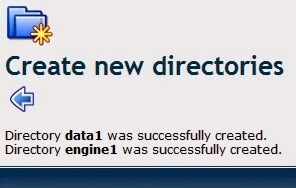 Also two sub-folders: ‘engine1’ and ‘data1’. ‘engine1’ contains various bits and pieces needed for Wowslider to work. ‘data1’ contains two further folders: ‘images’ and ‘tooltips’. I’ll talk about the other file: ‘iframe_index.html’ later. Now what I need to do is to transfer the files and folders in the ‘WOW Slider’ folder on my computer into the ‘public_html’ folder of my new website. 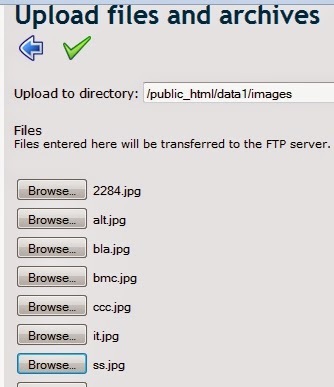 An easy way would have been to use ftp (file transfer protocol) with a program like Filezilla, but I wanted to use the tools which are available from the control panel of the site, which turned out to be a little more tricky. 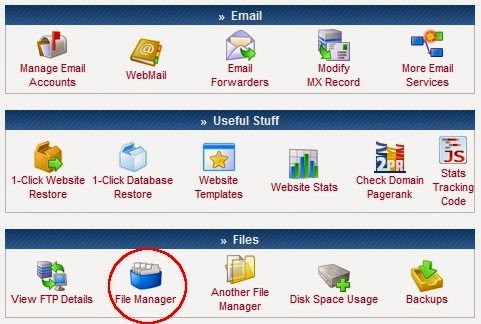 And, in the same way as before, click on the green ‘tick’ button to add the files, then click the blue ‘left arrow’ button to go back to the file manager. 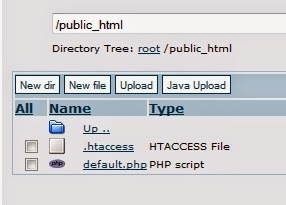 Now, in exactly the same way, you need to transfer the contents of ‘tooltips’ and also copy ‘index.html’ to the public_html folder. And that, as they say, is that!!! 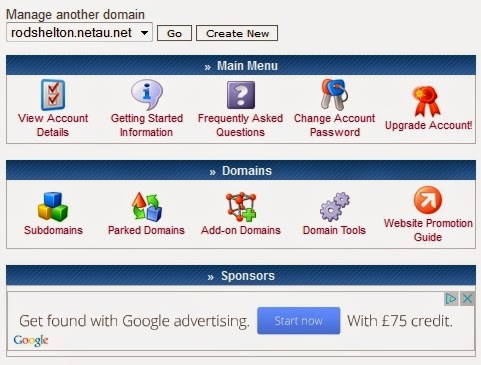 If you type www.yoursubdomain.netau.net into a browser (in my case this was www.rodshelton.netau.net), you will be able to see your slideshow. Perhaps it would be an idea to add that if you want to use your new website to store more than one wowslider slideshow, then copy the file ‘index.html’ saved by WOW Slider and save it as ‘something_else.html’. 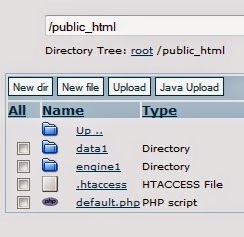 Then reference the iframe as src="http://www.yoursubdomain.netau.net/something_else.html". When saving another WOW Slider slideshow, remember to change the serial number of the slideshow, so it saves the folders as ‘data2’ and ‘engine2’, etc. etc. Hope that’s helpful. More ‘ How to …’ posts coming soon. easy steps to upload your wow slider design in blogger. Thank u so much bro,,,,I wasted my almost one sleepless week to solve it and u did this. do I need to upload my youtube videos on same hosting website if I m using wowslider with youtube videos or still I can link them without uploading them on 000webhost.com ? plz answer and thanks again.